from humidity in the atmosphere. Rainmaker Air-to-Water technologies provide communities with local, sustainable and affordable access to clean water. Using innovation in heating and cooling, our Air-to-Water unit produces clean water from the air. This product can be driven efficiently by wind, solar, grid, generator, or combinations. Water is produced at the point of use eliminating transportation and distribution cost. 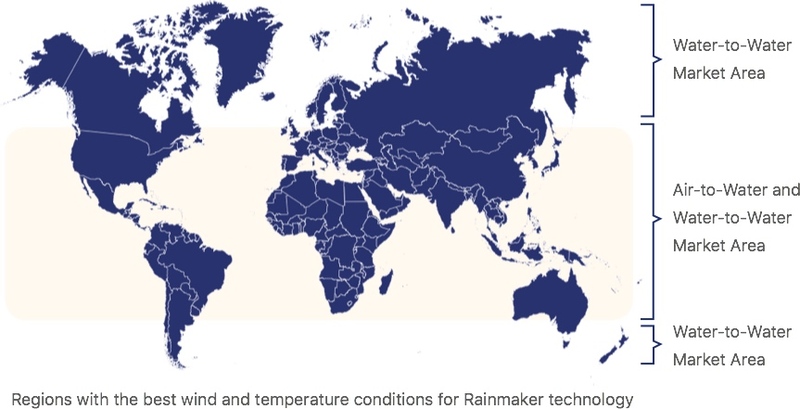 Customers for Rainmaker’s Air-to-Water technology include governments and communities, NGOs, military, and commercial or industrial companies. The need for Rainmaker’s Air-to-Water capabilities is clear. How Rainmaker’s Air-to-Water technology works. It is possible to harvest water from air almost anywhere in the world. Our core Air-to-Water unit uses a turbine that forces air through a heat exchanger, where the air is cooled and condensation takes place. A hybrid solution (solar/wind/grid) can be deployed to the same effect by driving a ventilation system. Lowering the temperature of air requires minimal energy. When the temperature falls below its dew point, water droplets will form. These droplets then collect in a water storage compartment. particular location will depend on the average wind speed, the ambient temperature, and the relative humidity. To make the system work under different conditions, the turbine can be adapted to the environment in which it will be used, such as adjusting the blade diameter and the height of the tower to maximize the efficiency of the unit. The turbine can also be combined with solar and/or traditional power to maximize water production. In each case, Rainmaker engineers will optimize a solution for every customer. Our Air-to-Water units use renewable energy and are available in three sizes, producing 5,000, 10,000 or 20,000 liters of drinking water per day. Rainmaker Air-to-Water units offer you the most flexibility for power options, depending on preferences and infrastructure. Wind, solar, or generator-powered units require no other electrical infrastructure. Requirements for Rainmaker’s Air-to-Water production. Benefits of Rainmaker Air-to-Water production. Our Air-to-Water system can be powered by a variety of energy sources with varying output capacities. Deployment can be as fast as 90 days after purchase order. Units are operational within 14 days after containers arrive on location. The world has plenty of seawater and polluted water. Up to now, the challenge has been to convert that water into drinking water at the point where it’s needed and at a scale that’s appropriate and affordable. The Rainwater Water-to- Water units have solved those problems.